This great little device emulates USB HID keyboard when connected to a PC USB port. It toggles Caps Lock key in random intervals, from 30sec to 8min hence driving the PC user simply crazy. Just imagine plugging in this little device in your coworkers' PC. 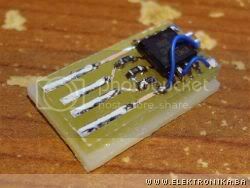 It is based on ATtiny45 microcontroller, powered from USB port and it is small enough not to easily notice it!